This past year I did a crazy day in Hong Kong. 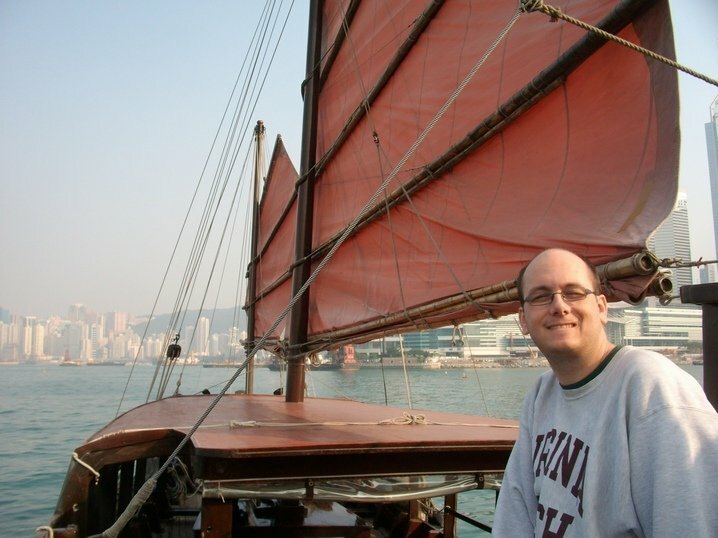 My prime sightseeing thing to do was to ride a Chinese Junk. The single day was really a long layover on my way to New Zealand as a way of breaking up the flights. So I didn’t have much time, but I love boats and the Chinese junk-style are pretty distinctive. So I knew I wanted to go on one. I normally don’t do an enormous amount of research for travel. I like to leave flexibility in discovering cool things along the way. This time in Hong Kong was so short that I had to get the timing down or I would miss things. While not a once in a lifetime type trip, Hong Kong is still far enough from Germany to not make it on a whim. So here is what I found out: The Hong Kong Tourist Board runs the junk tour. It runs several times a day but from alternate sides of the water. So if you start on Kowloon you will end up on Hong Kong Island. Don’t be worried about being on the opposite side of the river, the Star Ferry runs very often and is very cheap to use to cross. I did it 3 times in a single day. The tour itself is roughly an hour long and it just circles the harbor area. The price was 100HKD, but you have to pay cash at the tourist office which at the docks in Kowloon. I saw other tours being advertised for cheaper, but this was the only one on a junk. I really wasn’t there to see the harbor sights, just to ride on the cool boat so the little extra cash was worth it. Most sail boats we are used to seeing have triangular sails and a boom at the bottom of the triangle. 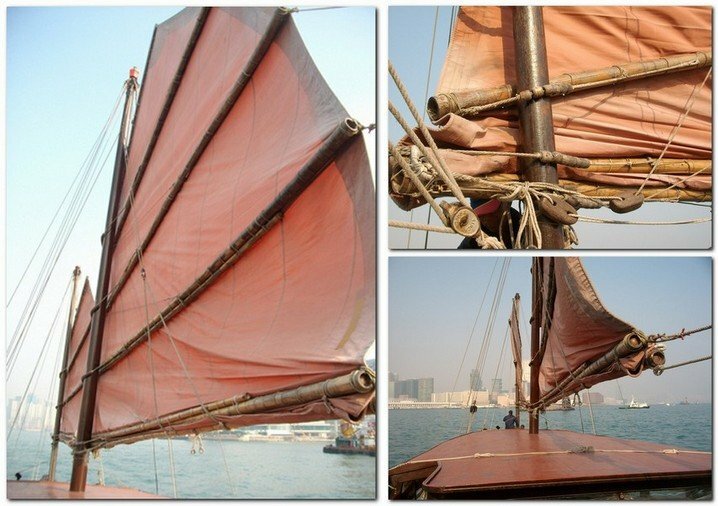 The junk rig is a vaguely trapezoidal and the sail is held up by a number of sticks instead of a single boom. Otherwise the principle is the same, raise the sails and let the wind blow you along. 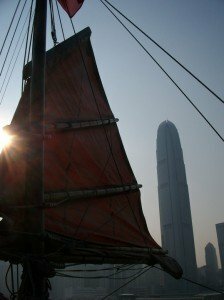 Given the basic idea of sailing I love that different cultures have developed different ways of exploiting the wind for transport. I remember as a kid reading about these boats and seeing pictures. It was really awesome to watch actually several junks sail about amongst the tankers in the harbor. This really made me feel like I was in a foreign place. The one for this tour is called Duk Ling. I have no clue what it means in Chinese, but I read it as duckling and chuckled. 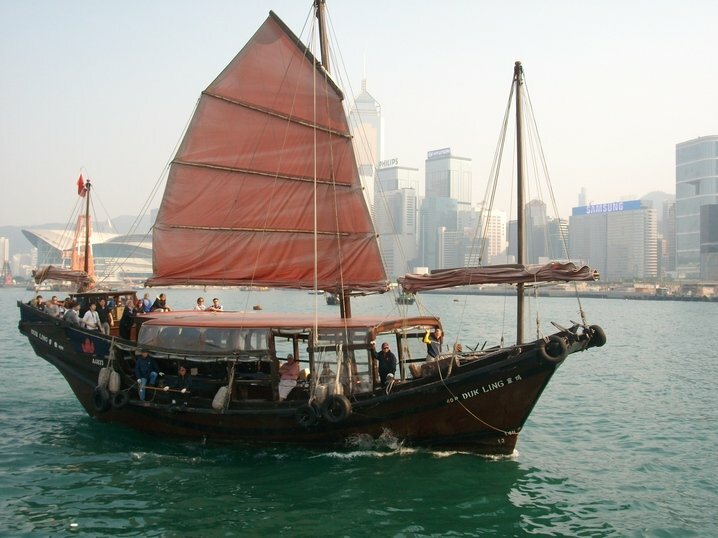 According to the HK Tourisn website, the Duk Ling is a restored fishing boat. It was not a large group of us on the boat, so we all crowded up on the back deck house to get the best view. I was in Hong Kong at Christmas time. 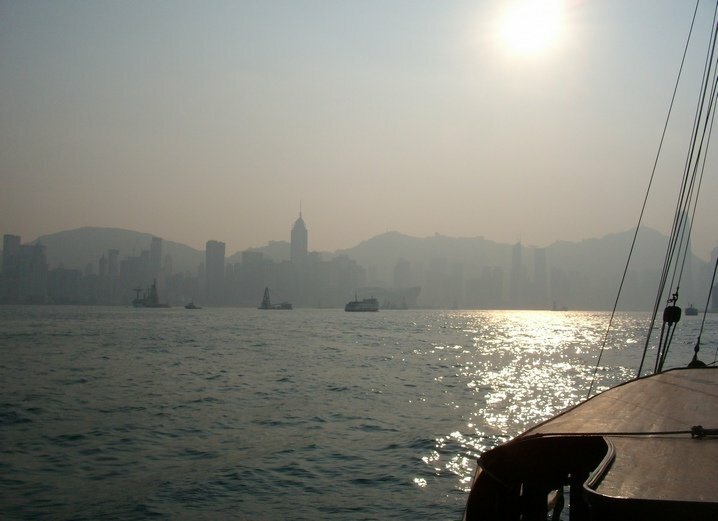 So it was winter, but since HK is so close to the tropics it was still quite warm. Germany had been cold when I left, so I was quite happy to walk around in my t-shirt. Even still, it was cool and windy out on the water. I was happy for my sweatshirt. Friends living in Hong Kong have told me it gets sweltering in the summer, so the wind could be quite nice then. I mostly ignored the recording that was playing explaining the sights and buildings we were sailing past. I was just having fun being on a junk. For me the thrill was the boat itself not the sights. I am quite happy that it worked out for my one day in Hong Kong. I didn’t see everything in my plan, but I did manage my #1. If you are in Hong Kong, even for just one day. It is totally worth the time and money to do this.